Lucky Bubbles, the winner of the Grade 1 Chairman's Sprint Prize last year and the lone challenger from Hong Kong for this year’s Grade 1 Sprinters Stakes, arrived safely at Narita International Airport in Chiba Prefecture early Tuesday morning. 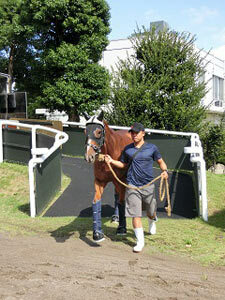 The 7-year-old gelding was then transported to the quarantine facilities at the JRA Horseracing School Quarantine Center, where he arrived at 10:05 a.m., completing about a 10-hour journey from his home base at Sha Tin. Lucky Bubbles, with eight wins from 26 career starts, won his first Grade 1 in the Chairman's Sprint Prize last May, but was winless in seven starts in his 2017-18 season, his best showing a runner-up in the Grade 2 Premier Bowl in October last year. He finished fourth to Mr Stunning in the Hong Kong Sprint. The Sprinters Stakes will be run on Sunday, September 30 at Nakayama Racecourse, with a scheduled post time of 15:40 local time.